I have been used to thinking of the Cultural Revolution as the immediate backdrop to the ideological transformations initiated by the establishment of Shenzhen. However, as I was reacquainting myself with the cultural geography of Huaqiangbei I came across the Zhenhua Industries sign on Zhenxing Road. The logo is a throwback to Third Front industrialization, when futurist aesthetics still informed nationalist dreams. But what actually caught my eye was Jiang Zenmin’s calligraphy; by providing the calligraphy (题词) for this enterprise, the former General Secretary showed explicit support for the manufacturing company. After all, the most famous example of Jiang Zemin’s calligraphy in Shenzhen was written for Window of the World in 1994, as part of Overseas Chinese Town’s transition to leisure and tourism. So I was curious: when and how did he actively support Zhen Hua specifically and the construction of the Shangbu Industrial Zone more generally? It’s called “the Southern Weekend Incident (南周事件)” in Mandarin and refers to a standoff between the Guangdong Provincial Minister of Information, Tuo Zhen and the editorial board of the Southern Weekend News Weekly (南方周末). If you’ve been following the story in the western press, you are well aware that at stake in the standoff is the question of just how free China’s press should be. However, if you’ve been following the story in Chinese, you’re also aware that what the Incident has revealed how serious disagreement between the two main factions in the central government are. So what happened and what might it mean? At the beginning of the year, the Southern Weekend editorial board decided to use “China’s dream, the dream of constitutional government “中国梦，宪政梦)” as the headline for their social commentary page. With the support of the National Minister of Information, Liu Yunshan, GD Provincial Minister Tuo Zhen change the headline to read “China is closer than it has ever been to achieving its dreams (我们比任何时候都更接近梦想)”. Apparently, Tuo Zhen made the changes after the editorial board had gone on holiday to celebrate the new year. On January 3, when they discovered what had happened, they went to weibo and announced that “After the Southern Weekend had already decided on its final draft, the editorial board left work, and thus were completely unaware that the Guangdong Provincial Standing Committee Member and Minister of Information Tuo Zhen directed the New Year’s words to be change and altered, leading to many mistakes. On January 4 the editorial board went on strike to protest Tuo Zhen’s heavy-handed intervention, garnering widespread support. Importantly, the content of the two editorials represent different factions within the central government. The expression “China’s dream, the dream of constitutional government” are quotations of current General Party Secretary Xi Jinping. In contrast, the idea that “China is closer than it has ever been to achieving its dreams” reflects the position of the Jiang Gang, who are supporters of the former General Party Secretary Jiang Zemin. Thus, the stakes in the conflict were two-fold: (1) the formal question of freedom of the press and (2) the political question of the Jiang Gang’s blatant challenge to Xi Jinping’s reforms. The day after the Incident became public, Xi Jinping gave a talk that went after one of the primary conflicts with the Jiang Gang — dismantling the labor camp system. Liu Yunshan responded by way of “The Southern Weekend‘s ‘to our readers’ Really Makes one Reflect (南方周末“致读者”实在令人深思)” an editorial that was published in the Global Times (环球时报). Subsequently, the Ministry of Information demanded that all subordinate newspapers print the editorial, supporting Tuo Zhen and attacking Southern Weekend. Not unexpectedly, there were different levels of cooperation with the Ministry; the editor-in-chief of New Beijing Times (新景报), Da Zigeng resigned in protest. Yesterday, in his first public appearance since the Southern Weekend Incident, Tuo Zhen was unrepentant. He opened the Guangdong Ministry of Information Meetings by announcing that the meetings transmitted the spirit of the national Ministry of Information, rather than the spirit of the new General Secretary’s reforms. The opposition to Xi Jinping was straight forward because on January 4 during its meetings, the national Ministry had made it clear that the mission of the Ministry of Information was to “continue to be guided by of Deng Xiaoping theory, the three represents thought, and the perspective of scientific development (要坚持以邓小平理论、‘三个代表’重要思想、科学发展观为指导)”. Thus in his opening speech, Liu Yunshan explicitly invoked Jiang Zemin’s political project (the three represents) and did not mention Xi Jinping’s project (constitutional government). So what happens now that Tuo Zhen has backed off, but not really, and an abbreviated version of the Southern Weekend came out as scheduled yesterday? Well the two meetings (两会) are upon us. The Chinese People’s Consultative Committee (全国政协) will meet March 3, 2013 and the National People’s Congress (全国人大) will convene on March 5, 2013. As important government positions are filled, inquiring minds are curious to see how successful the Jiang Gang’s attack on Xi Jinping will be, or whether Xi Jinping and the Princelings will solidify their authority. We’re also wondering whether or not the embattled General Secretary will be able to wrest control of the Ministry of Information away from the Liu Yunshan and Jiang Gang supporters, or if no matter what he does, it will be at odds with the truth that the Jiang Gang is putting forward. All this to say, more freedom of the press would be welcome precisely because we need open debate about these two positions — constitutional reform versus maintaining the status quo. Indeed, open debate would also allow for alternative voices to enter the conversation, allowing us to see how deep and far-reaching Xi Jinping’s reforms might actually be. In anticipation of the 18th National People’s Congress (and possible trial and sentencing of Bo Xilai and concomitant rise of Wang Yang), I am offering a bit of policy by number — one country, two systems, for example. Chinese policies (at all levels of government) tend to come in easy to remember chunks, which in turn are parsed and memorized in politics class. Of course, in addition to politics classes taught in actual schools, all government organizations also unpack the latest phrase because as the ill-fated reception of Jiang Zemin’s “three represents” demonstrates, its possible to disseminate a catchy catchphrase without the larger public actually figuring out is being said. One Country, Two Systems (一国两制; Deng Xiaoping, 1984) refers to the decision that Hong Kong would remain administratively separate from the PRC and was used again for the return of Macau, allowing both Special Administrative Regions to continue business operations as they had under colonialism, even as political authority shifted to Beijing. The phras also anticipates the return of Taiwan. Three Represents (三个代表; Jiang Zemin, 2000) refers to which Chinese interests the Party represents, namely 1. the demand for progressive production capacity; 2. the cutting edge of progressive cultural production, and 3. the basic interests of the vast majority of the People. Unfortunately, even in Chinese the three represents are counter intuitive (1. 始终代表中国先进社会生产力的发展要求；2. 始终代表中国先进文化的前进方向；始终代表中国最广大人民的根本利益) and many thought that the phrase referred to three representatives of Marxism: Marx, Lenin, and Mao. But again, if we were talking about the people’s representatives in the post Mao era, where was Deng Xiaoping’s place in all this? Four Modernizations (四个现代化；1st plenary session of the 3rd National People’s Congress, December, 1964) refers to the imperatives to modernize industry, agriculture, national defense, and science and technology research (工业现代化、农业现代化、国防现代化、科学技术现代化). The four modernizations where to be accomplished in two, 15 year steps (两步走), or to modernize over the course of 6 five-year plans. Step 1 was to establish a modern industrial base and economic system by 1979; step 2 was to bring China’s industry and economy to the world by 1995. In the 3rd plenary session of the 11th National People’s Congress, Deng Xiaoping memorably reestablished the four modernizations as the guiding policies. Three attacks, two establishments (三打两建; Wang Yang, 2011) are the current Guangdong Provincial government’s commitment to attack monopolistic markets, to attack piracy, and to attack corruption and establish systems of social trust and marketplace oversight (打击欺行霸市、打击制假售假、打击商业贿赂；建设社会信用体系、建设市场监管体系). Five Chongqings (五个重庆; Bo Xilai, 2008) marked the beginning of the Chongqing Model of development, and referred to inhabitable Chongqing, smooth traffic Chongqing, forested Chongqing, safe Chongqing, and healthy Chongqing (宜居重庆、畅通重庆、“森林重庆、平安重庆和健康重庆). Eight Honors, Eight Shames (八榮八恥; Hu Jintao, 2006) were promoted to cultivate the moral conscious of Party members; patriotism is an honor, while harming the country is a shame; serving the people is an honor, while turning one’s back on the people is a shame; respecting science is an honor, while stupidity is a shame; hard work is an honor, while sloth is a shame; solidarity is an honor, while the pursuit of self benefits is a shame; being trustworthy is an honor, while being opportunistic is a shame; upholding the law is an honor, while breaking the law is a shame; struggle is an honor, while arrogant greed is a shame (坚持以热爱祖国为荣、以危害祖国为耻，以服务人民为荣、以背离人民为耻，以崇尚科学为荣、以愚昧无知为耻，以辛勤劳动为荣、以好逸恶劳为耻，以团结互助为荣、以损人利己为耻，以诚实守信为荣、以见利忘义为耻，以遵纪守法为荣、以违法乱纪为耻，以艰苦奋斗为荣、以骄奢淫逸为耻). Ironies of the great firewall continue: We can now access information about Tian’anmen, but still can not directly get onto wordpress. Does this mean that whatever else he has done with or without Jiang Zemin’s blessing, Wen Jiabao looks good in Tian’anmen press? Or perhaps Tibet and Hu Jintao’s role in the March 5 Lhasa crackdown (also in 1989) remains more sensitive than Jiang Zemin’s role in the June 4 crackdown because so many leaders and members of the Han public continue to refuse to discuss 1959? 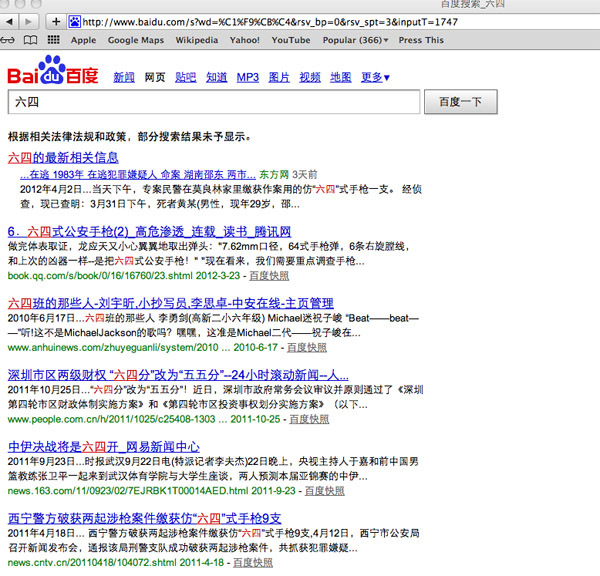 That said, nevertheless, today I’m feeling hopeful: we can baidu 六四! Learning to read Chinese media more often than not means learning to understand the significance of the information to those playing behind the walls of Zhongnanhai. Today, for example, it is possible to get on Baidu (百度) and successfully search for Falungong (法轮功). We all know that 1999, Jiang Zemin ordered the violent suppression of Falungong. This led to over a decade of sustained persecution against practitioners. Observers speculated that he did so because he (and others in the Party) saw Falungong as not being a religious organization, but rather a potential political player in Mainland society. In English, Michael J. Greenlee provides a useful overview of the organization’s history and Jiang Zemin’s response. However, for many of us the most interesting part of ending censorship of information on Falungong is not that we can now jump to Li Hongzhi’s tomes 大圆满法 and 转法轮, but rather that it signals the end of the Jiang era. The Two Meetings are churning relentlessly forward and it seems that power has been wrested from Jiang’s hands. Jiang Zemin came to power precisely because he was willing to implement Deng Xiaoping’s decision to suppress anti-corruption protests in June 1989. Moreover, it’s been a while since we could baidu ourselves to information about Zhao Ziyang, the former Party Secretary who apparently did not support the use of violence against protestors. So the question du jour is: will the firewall on news about Tian’anmen also fall? Or will Tian’anmen remain off limits as long as Reform and Opening remains the main Party line and Deng Xiaoping is identified as its architect? Her father explained Mao’s appointed heir had been at the center of a political struggle with Deng Xiaoping to decide if China would continue Maoist policies or pursue reform. This struggle ended with a coup d’etat and the Sino-Vietnamese War as Deng Xiaoping gained political control by securing support of military leaders and high-ranking Party commissars. We then mused about the relationship between violence and political succession, even if indirectly, because Jiang Zemin (江泽民) only became Deng’s appointed successor in the aftermath of Tian’anmen and Zhao Ziyang‘s (赵紫阳) fall.